Yasuo Kobayashi Soshihan takes ukemi from a beginner’s throw. This teaching style is a good model for all instructors. 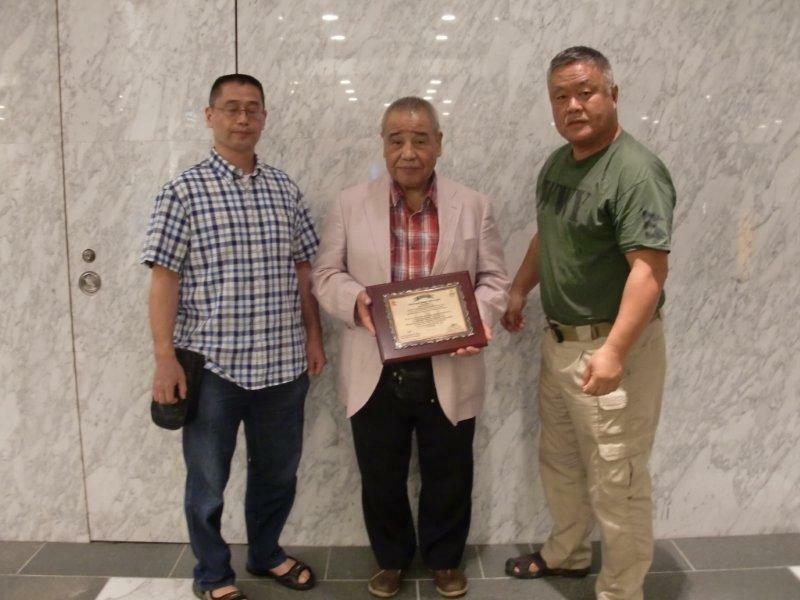 Yasuo Kobayashi Soshihan, Aikikai Aikido Kobayashi Dojo Head Shihan (http://www.kobayashi-dojo.com/english/ ) stopped by Aikido Nippon Kan General Headquarters on his way to teach a seminar in Omaha, Nebraska June 1st-3rd, 2015. In 2014 direct flights from Tokyo to Denver were added by the airlines which made Denver a transition stop in Kobayashi Soshihan’s travel itinerary. 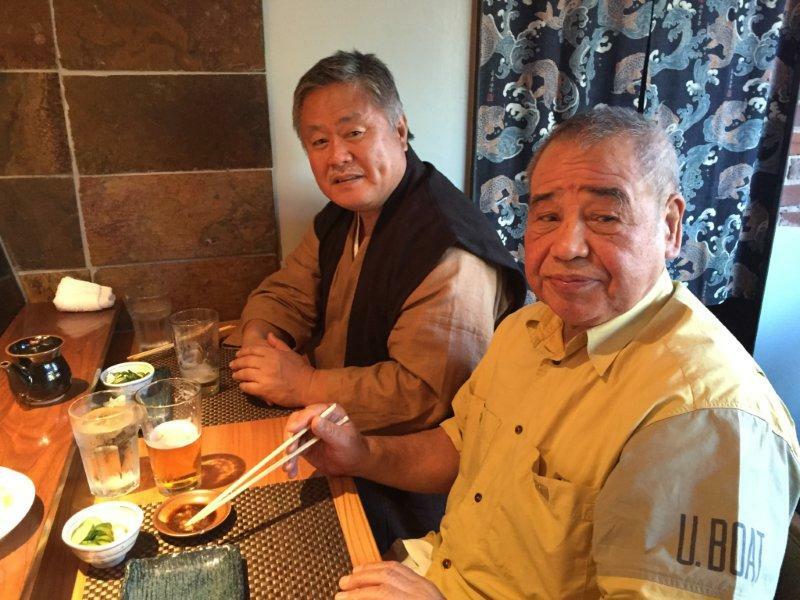 Kobayashi Shihan took a couple days to rest in Denver before continuing on to teach at the seminar in Omaha. I was an uchideshi in Iwama and otomo to the Founder, Kobayashi Soshihan was a shihan at Aikikai Hombu in Tokyo. Kobayashi Shihan always took good care of me on my trips to Tokyo with the Founder, something I will never forget. 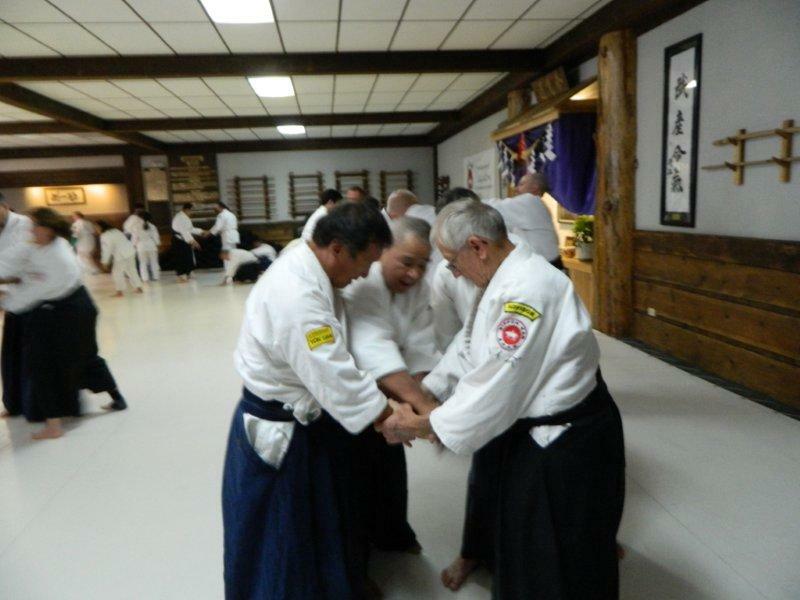 Kobayashi Shihan is a very valuable living testimonial to our Aikido history and a living treasure to our entire Aikido community; Aikikai or independent organizations alike. There are very few instructors left from this generation and Kobayashi Soshihan has a great deal to teach us all. Kobayashi Shihan came to visit Aikido Nippon Kan General Headquarters in 2008 and I also traveled Kobayshi Shihan to Iran that year. In the last few years, Kobayashi Soshihan has been sending uchideshi students from the Aikido Kobayashi Dojo Organization to Aikido Nippon Kan Dojo for uchideshi training. 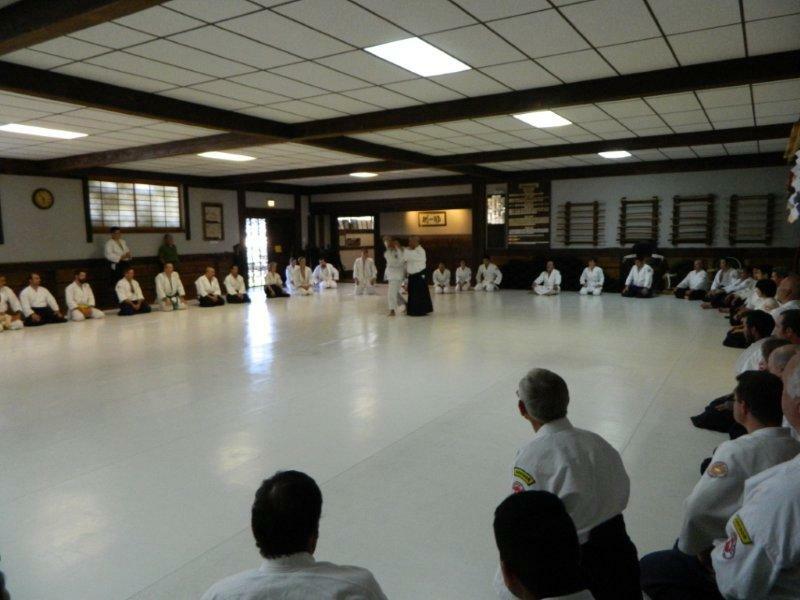 During his Denver visit, Kobayashi Shihan stopped by Nippon Kan Dojo. As he watched an ongoing class he said, “I need to maintain my physical condition before this upcoming seminar so I want to exercise a bit”. To everyone’s delight Kobayashi joined class and taught a special 1 hour 20 minute class for Nippon Kan students. There is even a name for this! Tobikomikeiko is the word in Japanese for jumping into a practice unannounced at another dojo! 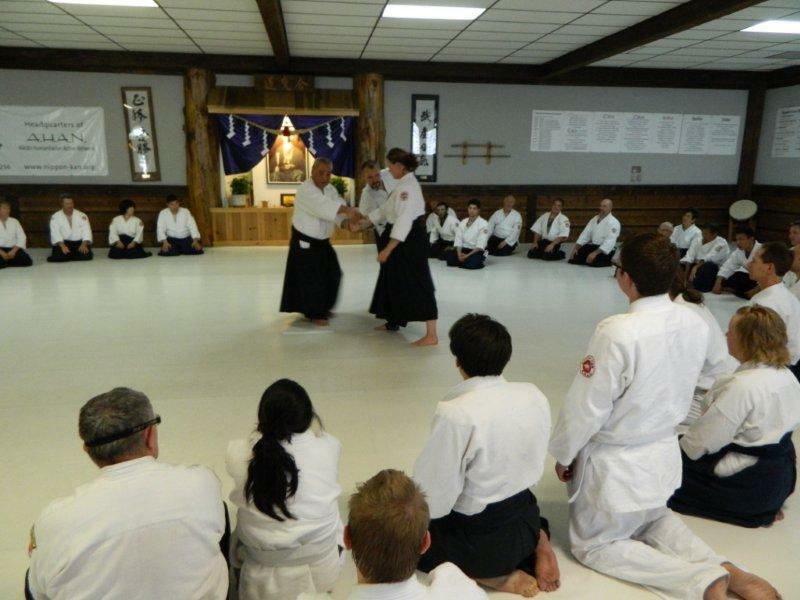 During this special class, Kobayashi Soshihan took much ukemi while teaching students. We could not believe the energy he had at 79 years old! He taught with impeccable skill, timing and good humor and the applause never stopped. It was a wonderful visit and a proud time for us to have him practice at our dojo. I was personally very proud. 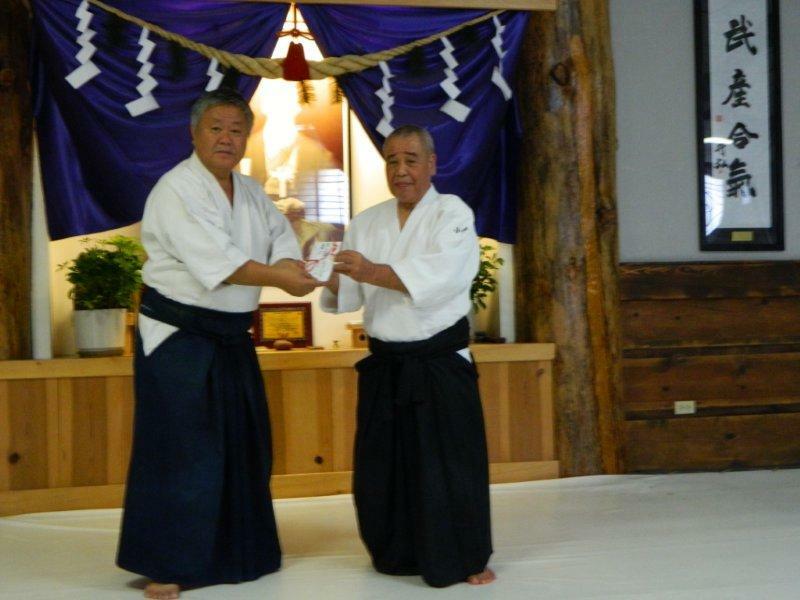 We wish Kobayashi Soshihan the best of health and best wishes in continuing to share his Aikido all over the world. Accompanying Kobayashi Shihan as otomo was Kobayashi Dojo Shidoin, Yuji Casahara Sensei. Thank you for joining us in Denver and thank you for your assistance! Homma Kancho receiving donation for Nepal WWY earthquake youth assistance projects. During this visit, Kobayashi Soshihan delivered donated funds gathered by Aikido Kobayashi students in Japan for relief efforts in Nepal following the devastating earthquake of April 25th, 2015. This donation of $5600 USD was presented to Homma Kancho and will be used in the AHAN Nippon Kan Nepal Ranger WWY (We’re with You) Project Foundation established in June 2015. Great Nepal Earthquake April 25th, 2015: Immediate Response-Enduring Support.